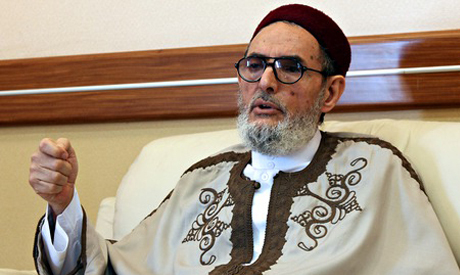 The Libyan Grand Mufti is reportedly being investigated in the UK on suspicion of inciting violence and Islamic insurgency in his home country. UK media reports say Sheikh Sadiq Abdelrahman Al-Ghariani is suspected of using Tanasuh, a UK-based Internet TV channel, to encourage Islamist fighters trying to overthrow the government in Libya. Al-Ghariani is allegedly accused of using Britain as a base to support or orchestrate the takeover of Libya by extremist militias with ideological links to Islamic State fighters in Syria and Iraq. Responding to questions by Ahram Online, the UK Home Office refused to comment directly on Al-Ghariani. However, a spokeswoman said that authorities are checking online materials that could encourage violence and extremism. The reported Ghariani investigation comes a day after the UK's terror threat level was raised from “substantial” to "severe” in response to the deepening conflict in Iraq and Syria. David Cameron, the UK prime minister, said Friday that security services had taken down 28,000 instances of extremist material from the internet this year alone. “Anyone who seeks to foster hatred or promote terrorism is not welcome in the United Kingdom,” the Home Office spokeswoman said. “All cases are being kept under close review,” she confirmed. The residency status of Al-Ghgariani in the UK is not clear. The home secretary has the power to order his deportation “on national security grounds” if his speeches are proven to promote extremism. The Labour Party opposition in the UK recently asked the government to look into Al-Ghariani's behaviour. In a recent sermon broadcast on Tanasuh TV, the Libyan sheikh appeared to call for Libya Dawn to widen its assault on the regime, urging “revolutionary brigades” to turn their fire on other areas, including Tobruk, to where the country’s parliament fled. There is no nationalist movement in Libya, there are only CIA agents. The Islamic movement in Libya is the true voice of the people. No Sissi coup in Libya..no Rabaa massacre, no Coptic Church conspiracy. Whey do they allow such pollution in Europe is beyond me. terrorist thugs like you will be eradicated eventually.